Research suggests that ergonomists tend to restrict themselves to two or three of their favorite methods in the design of systems, despite a multitude of variations in the problems that they face. Human Factors and Ergonomics Methods delivers an authoritative and practical account of methods that incorporate human capabilities and limitations, environmental factors, human-machine interaction, and other factors into system design. The Handbook describes 83 methods in a standardized format, promoting the use of methods that may have formerly been unfamiliar to designers. The handbook comprises six sections, each representing a specialized field of ergonomics with a representative selection of associated methods. The sections highlight facets of human factors and ergonomics in systems analysis, design, and evaluation. Sections I through III address individuals and their interactions with the world. Section IV explores social groupings and their interactions (team methods), and Section V examines the effect of the environment on workers. 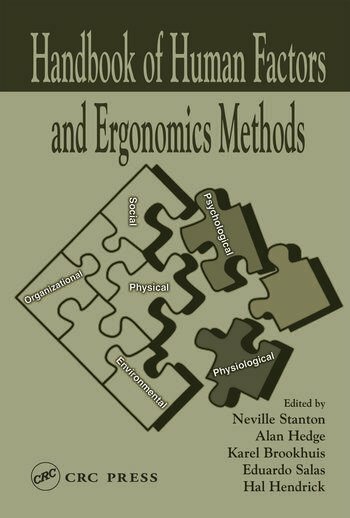 The final section provides an overview of work systems-macroergonomics methods. An onion-layer model frames each method; working from the individual, to the team, to the environment, to the work system. Each chapter begins with an introduction written by the chapter's editor, offering a brief overview of the field and a description of the methods covered. The Handbook provides a representative set of contemporary methods that are valuable in ergonomic analyses and evaluations. The layout of each chapter is standardized for ease-of-use, so you can quickly locate relevant information about each method. Content descriptions are brief, and references are made to other texts, papers, and case studies. Standard descriptions of methods encourage browsing through several potential methods before tackling a problem. "Hanbook of Human Factors and Ergonomics Methods is one of the best resources to identify methods of tackling human factors (neck up) and ergonomics (neck down) problems encountered in greater society."